The WSJT program offers a wide range of digital modes for both the HF and VHF / Microwave operator. Developed by Joe Taylor and a team of volounteer developers, WSJT-X is open-source programs designed for weak-signal digital communication by amateur radio. Normal usage requires a standard SSB transceiver and a personal computer with soundcard, or the equivalent. The program is available free of charge, licensed under the GNU General Public License. 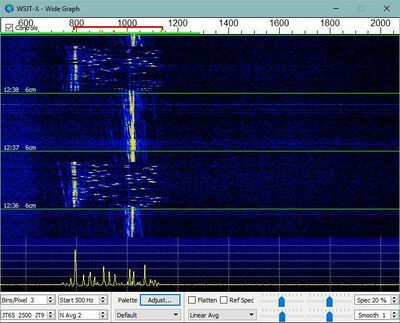 WSJT-X implements communication protocols or "modes" called JT4, JT9, JT65, QRA64, ISCAT, MSK144, and WSPR, as well as one called Echo for detecting and measuring your own radio signals reflected from the Moon. These modes were all designed for making reliable, confirmed QSOs under extreme weak-signal conditions. All but ISCAT use nearly identical message structure and "source encoding," the efficient compression of standard messages used to make minimal QSOs. 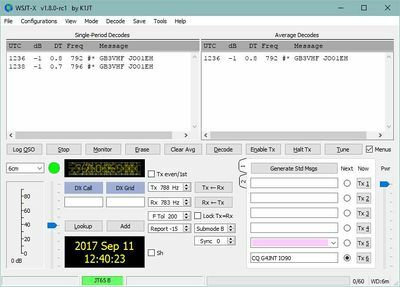 JT65 and QRA64 were designed for EME ("moonbounce") on the VHF/UHF bands; JT65 has also proved very popular and effective for worldwide QRP communication at HF. JT9 is optimised for the LF, MF, and HF bands but is now being used in a Fast variant by UK amateurs on 1296MHz. It is about 2 dB more sensitive than JT65 while using less than 10% of the bandwidth in its normal slow modes. JT4 is best suited for the higher microwave bands where its wide tone spacing submodes - wider than any of the other modes - can be used to overcome rainscatter and other frequency dispersing propagation mechanisms. If you have set all the parameters correctly you should see decodes in the left hand window of the main program as shown in this screen grab by G4JNT. The JT9F-Fast mode (read the user manual for full details of all JT9 options) is becoming increasing popular for conducting 2 way QSOs on difficult fading paths on 1296MHz. You will need to ensure that you have set up CAT control of your rig and the audio in and out from the PC to the rig correctly - take time to do this before you want to have a QSO as it can be very time consuming! The following settings should be used in WSJT-X - make sure you always have the latest version as features are being added all the time. Under file/settings/general make sure VHF/UHF/microwave is ticked and the Call sign and QRA locator information completed. Tx and Rx tone frequencies are set, ideally to the same value, try 700Hz to start with. Note: Tx and Rx tone frequencies can be anywhere within the SSB audio bandwidth, but unless you have good reason to do otherwise, ensure Tx and Rx use the same value. It is recommended that you listen first and try to get some decodes appearing in the left hand "band activity" window. Once you have a call sign decoded in the window, trying clicking on it and it should appear in the DX call window under the frequency display. To have a QSO, try to work out first if the remote station is transmitting 1st or 2nd time period (watch the green time slot bar at the bottom of the window) and tick your box with the other time slot. Now tick Auto seq and press the generate std messages box - you will see the 6 standard messages appear in the text boxes on the right with your and Dx station callsigns. Select "Tx 1"
Now you are ready to transmit, click the "Enable Tx" button and the system should wait for the selected time slot and start calling the remote station. JT4 mode in its wide spaced variants is used for the higher microwave frequencies. Several microwave beacons transmit JT4G and the somewhat narrower JT4F is commonly used for 10GHz EME. The JT4 decoder does not search for signals look over the entire SSB bandwidth in same the way that JT9 and JT65 works, so more care needs to be taken with setting the tone frequency and tuning. Tx and Rx tone frequencies set taking into account SSB tuning dial, and to the same value. This page was last modified on 9 October 2018, at 20:21.